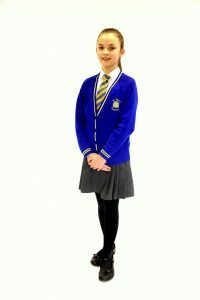 Children are expected to wear school uniform at all times and it is sold at the National Schoolwear Shop in Hanley. 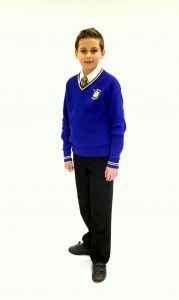 The jumpers have the school logo embroidered onto the garments. – Grey trousers or shorts, skirt or pinafore. The pictures below show our uniform. In summer girls are able to wear blue summer dresses. The National Schoolwear Shop also sells the school’s PE kit. Jewellery must not be worn with the exception of watches. No sculptured hair styles please. No coloured nail varnish or false nails allowed.